A transformation deck of cards inspired by birds, created by paper-cutting artist Emmanuel Jose. 1,017 backers pledged $36,469 to help bring this project to life. I'm an artist and I love playing cards. 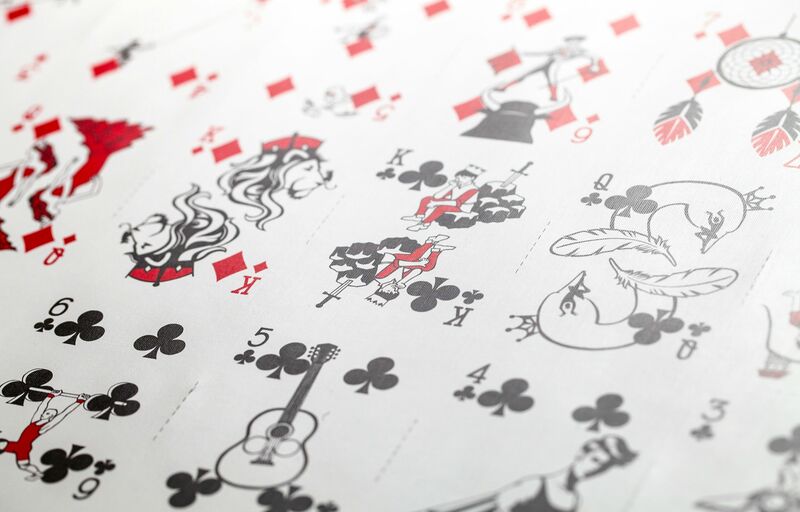 For over 3 years now, I've been making 1 paper-cut playing card a week. I make transformation playing cards, which incorporate the suits into a design. I've made 3 complete decks, with a 4th deck in progress. My first deck, Curator, became a real deck of cards in 2012. Now, I'm excited to turn my second paper-cut deck, Clipped Wings, into a reality for everyone to enjoy. CLIPPED WINGS is a celebration of birds. As a child, I had talking Myna birds as pets. They were family to me, and I've had a love of birds ever since. Clipped Wings is a fully custom deck featuring 55 unique works of art, all entirely cut by hand. A GIF of the Clipped Wings deck. Every card is 2 feet tall. Click to enlarge. Last year, the entire Clipped Wings deck was on display at Bridgewater State University, MA. 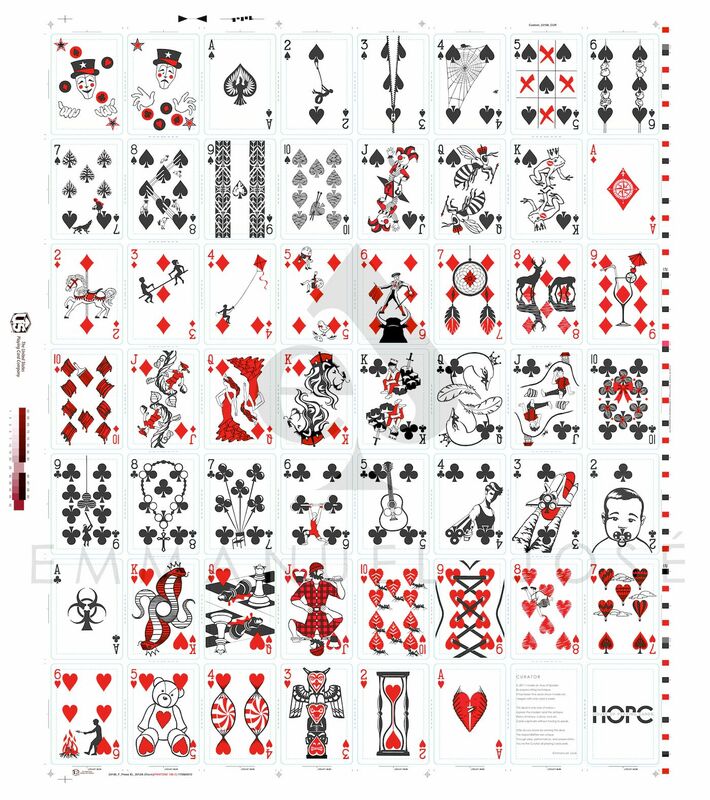 The Clipped Wings Deck will be printed by the US Playing Card Company, makers of the famous Bicycle® brand of playing cards. The deck will have Bicycle Stock and Air-Cushion Magic Finish, and it will have poker-size dimensions (2.5 x 3.5 inches). The Ace of Spades from the Curator deck pictured with the original artwork. The Clipped Wings deck will have the same stock and finish as the Curator deck. The Clipped Wings tuck case. 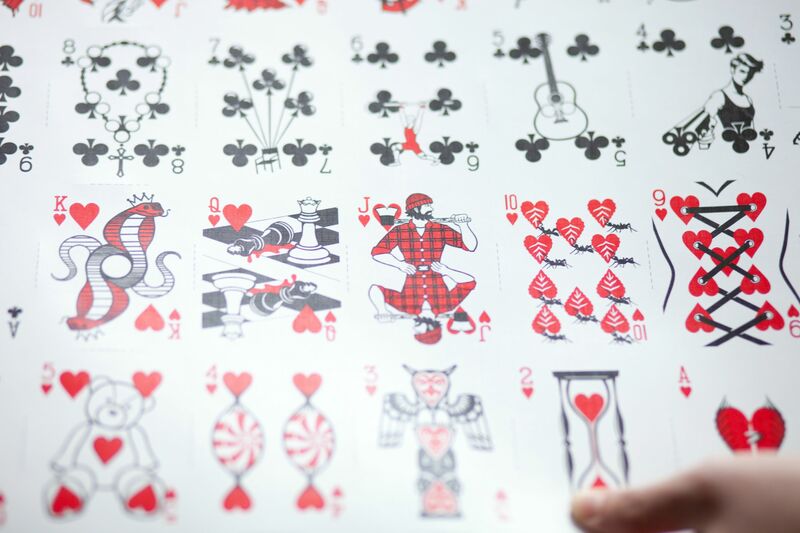 Uncut sheets are pulled from the presses at the US Playing Card Company before they are cut into individual cards. On its own, the Clipped Wings uncut sheet is a striking work of art that is perfect for display. The dimensions are 22 x 26.5 inches. The front side of the Clipped Wings uncut sheet. Click to enlarge. Hardcover Collector's Art Books are available for the Clipped Wings deck and the Curator deck. Each 32-page book has a dust jacket and measures 11.25 x 8.75 inches. The books reveal little-known information about the cards, and the Clipped Wings book states the bird species that are represented. Each book will be signed. The pages of the Clipped Wings book. The pages of the Curator book. These are just some of the many images available as prints. Frames not included. 115 different images are available as prints. The prints will be signed and will have a matte finish. Click here to see a gallery of all available prints. Click on an image to see dimensions and the print code. When the campaign ends, a survey will be sent out and the codes will be used to indicate your selection. Fun Trick: if you're on a desktop or laptop computer, "shuffle" the cards by varying the width of the browser window. I'm offering signed, matted sets of the characters that I make every week. These are NOT prints; each character is cut by hand, and they become the indices of every card I create. The indices are the playing card corners that indicate the rank and suit. Matted set of the 4 suits. The dimensions are 8 x 10 inches. Matted set of the index characters. The dimensions are 16 x 20 inches. Last year, I was inspired by other paper-cutting artists to create 3D paper-cut art. Numerous layers of hand-cut paper (up to 180 layers) create the 3D effect. If you pledge for this reward, I'll consult with you about the image that you want me to create. Framing will be included. The black wood frame will add 2 to 4 inches to each side of the art, which will measure 8.5 x 11 inches. For two pledge levels, I will create custom 2D paper-cut art. If you pledge for this reward, I'll consult with you about the image that you want me to create. Framing will be included. The frame will add 2 to 6 inches to each side of the art, which will measure 18 x 24 inches. NOTE: For this reward, I cannot create a paper-cut duplication of prior artwork. A Save the Date that I made for friends. The final product was letterpressed printed. The paper-cut barbecue poster I designed for a company in Raleigh, NC. The halos were removed for the posters they printed, but I added the halos back after they scanned it. The Curator uncut sheets are unlocked! These second edition Curator uncut sheets are available as add-on items. Each sheet is $40 ($55 for International). The dimensions are 22 x 26.5 inches. Please scroll down to the "Customizing Your Rewards" section to see an updated add-on chart. This chart lists the dimensions for 1 quantity of an item. If possible, rewards will be shipped in one package, but uncut sheets and prints will be shipped in mailing tubes. If you'd like additional rewards, please see the chart below and add the corresponding price of the item(s) to the amount you've already pledged (click the blue "Manage Your Pledge" button at the top of this page). When the campaign ends, you'll be able to confirm your purchases. Please contact me if you have any questions. If you're an international backer or you're shipping outside the U.S., please be sure to use the listed prices in the International Backers column. Thank you so much for taking the time to look at Clipped Wings. I'm excited to share my art with you, and I know that with your support, we can make this deck a reality. This is my first Kickstarter campaign, but this is not my first deck. The artwork for Clipped Wings is already complete and has approval from the US Playing Card Company. While delays can occur in their production line, I do not anticipate any printing delays interfering with the time-frame I've set up for delivery. Should any unforeseen issues arise, I will swiftly resolve them. EARLY BIRD - 1 signed deck of Clipped Wings. 1 deck of Clipped Wings. 2 decks of Clipped Wings. 3 decks of Clipped Wings. 1 deck of Clipped Wings, 1 signed and matted set of the 4 suits. Please scroll down to see photos of matted sets. EARLY BIRD - 1 signed deck of Clipped Wings, 1 signed uncut sheet of Clipped Wings. Please scroll down to see photos of the uncut sheet. 4 decks of Clipped Wings. 1 deck of Clipped Wings, 1 uncut sheet of Clipped Wings. Please scroll down to see photos of the uncut sheet. Half-Brick: 6 decks of Clipped Wings. 1 deck of Clipped Wings, 1 signed art print of your choice. Please see art print description to see full gallery. You'll be able to indicate your selection when the campaign ends. 1 brick (12 decks) of Clipped Wings. 2 signed decks of Clipped Wings, 1 signed collector's art book of your choice (Clipped Wings OR Curator). Please scroll down to see photos of books. 2 signed decks of Clipped Wings, 2 signed collector's art books (Clipped Wings AND Curator). Please scroll down to see photos of books. 2 signed decks of Clipped Wings, 1 signed and matted set of the index characters. Please scroll down to see photos of matted sets. 1 framed, custom, 3D paper-cut art. I'll consult with you about the image you want me to create. Please scroll down to see 3D art photos. This pledge includes 6 signed decks of Clipped Wings. 1 framed, custom 2D paper-cut art. I'll consult with you about the image you want me to create. NOTE: I cannot create a paper-cut duplication of prior artwork. This pledge includes a signed brick of Clipped Wings. 1 signed brick of Clipped Wings, 1 signed uncut sheet of Clipped Wings, 2 signed collector's art books (Clipped Wings and Curator), 1 custom 2D paper-cut art. I'll consult with you about the image you want me to create, and the frame is included. NOTE: I cannot create a paper-cut duplication of prior artwork. This pledge also includes DECK THEME SELECTION: I present my list of ideas to you, and from that list, you select the theme for my 2015 deck of cards.